Oake Meadows in Taunton is continuing its community support with a partnership of a local homeless charity. The home has established a relationship with Taunton-based charity, Arc, formerly Taunton Association for the Homeless, and has a series of events planned for the coming months. As part of its fundraising activities, Oake Meadows’ Activities co-ordinator, Louis du Toi, recently joined more than 80 fundraisers for the Arc’s annual Big Sleep Out to raise money and awareness of the work the local charity does. Participants of the Big Sleep Out were required to spend the night on a sleeping bag and piece of cardboard, in the car park of Taunton Football Club. The event raised £10,792.54 in total for the charity. The relationship with Arc has also benefitted the Wyvern Road care home. Each year, Marks & Spencer chooses local projects to get involved with and regularly chooses Arc as its Taunton-based charity. This year, the charity asked the retailer to assist Oake Meadows with its dementia-friendly garden project. 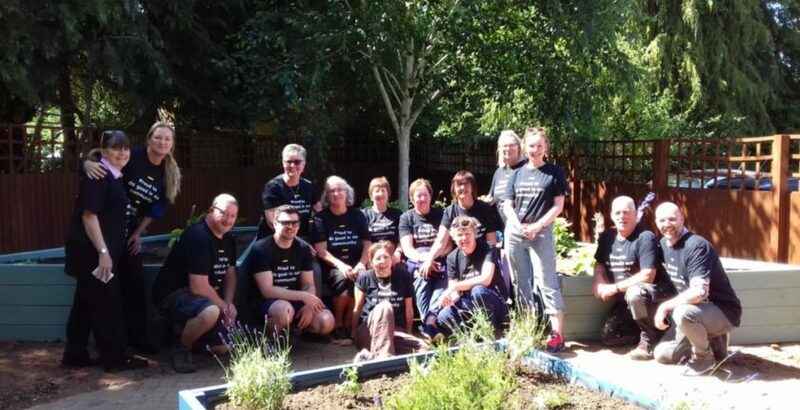 M&S donated £500 for new plants and paint, and 12 of the retailer’s employees helped to transform the care home’s garden. Katrina Ball, home manager at Oake Meadows said: “Our relationship with Arc has proven to be very successful and we are proud to support a charity that does a fantastic job of helping the most vulnerable individuals in our community.